Whether you’re producing your own videos for publication or embedding other people’s videos, placing a video file in a WordPress blog post has never been easier. Check out a good example of a video blog at TMZ, which is a popular celebrity news website that produces and displays videos for the web and for mobile devices. Several video galleries on the web today allow you to add videos to blog posts — Google’s YouTube service is a good example of a third-party video service that allows you to share its videos. Adding a video from the web, in these steps, adds only a hyperlink to the video. Use these steps if all you want to do is link to a page that has the video on it, rather than embedding the video in your blog post or page. Click the Add Media button on the Add New Post page to open the Insert Media window. Click the Insert from URL link on the left. The Insert from URL page appears. Type the URL (Internet address) of the video in the Insert from URL text box. Type the full URL, including the http:// and www portion of the address. Video providers, such as YouTube, usually list the direct links for the video files on their sites; you can copy and paste one of those links into the Video URL text box. (Optional) Type the title of the video in the Title text box. Giving a title to the video allows you to provide a bit of a description of the video. Provide a title if you can so that your readers know what the video is about. A link to the video is inserted into your post. WordPress doesn’t embed the actual video in the post; it inserts only a link to the video. Your blog visitors click the link to load another page in which the video plays. The preceding steps give you the ability to insert a hyperlink that your readers can click to view the video on another website (such as YouTube). However, if you use WordPress’s nifty Auto-Embed feature, WordPress will automatically embed many of these videos within your posts and pages. With this feature, WordPress automatically detects that a URL you typed in your post is a video (from YouTube, for example) and wraps the correct HTML embed code around that URL to make sure that the video player appears in your post (in a standard, XHTML-compliant way). The Auto-Embed feature is automatically enabled on your WordPress site; all you need to do is type the video URL within the content of your post or page. 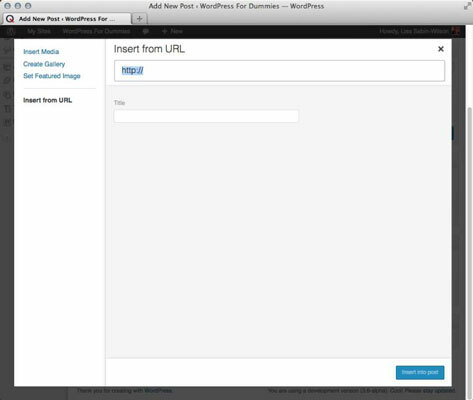 Currently, WordPress automatically embeds videos from YouTube, Vimeo, Dailymotion, Blip, Flickr, Hulu, Viddler, Qik, Revision3, Photobucket, and Google Video, as well as VideoPress-type videos from WordPress.tv. Click the Add Media button on the Edit Post or Add New Post page. The Insert Media window appears. Click the Upload Files tab at the top and then click the Select Files button. Select the video file you want to upload and then click Open. The video is uploaded from your computer to your web server, and the Insert Media window displays your uploaded video selected and ready for editing. In the Attachment Details section, type a title for the file in the Title text box, a caption in the Caption text box, and a description in the Description text box. Still in the Attachment Details section, select the Link To option. You can link to a custom URL, the attachment page, or the media file, or you can link to nothing at all. WordPress doesn’t embed a video player in the post; it inserts only a link to the video. However, if you have the Auto-Embed feature activated, WordPress attempts to embed the video within a video player. If WordPress cannot embed a video player, it displays the link that your visitors can click to open the video in a new window.